That happened with this Kadhai Paneer also. I was thinking of making a paneer dish but was not sure which one. Then I found these red and green bell peppers in the vegetable tray. So the choice came naturally, I was making Kadai Paneer for dinner. Kadai or Kadhai is a round bottom frying pan used in Indian kitchen. This is very similar to a stir fry pan, only with two handles on the sides. Kadhai is a type of preparation where the spices are coarsely ground. 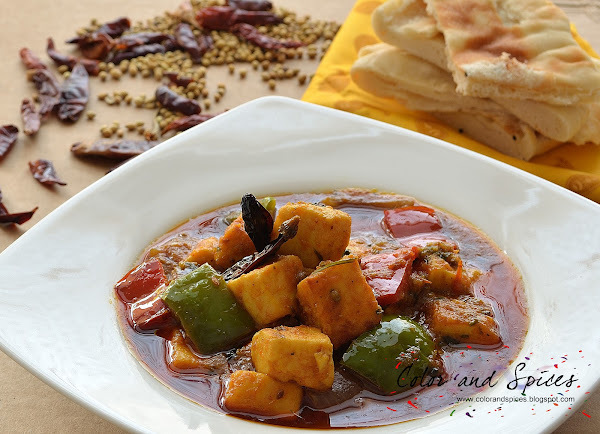 Kadhai dishes are generally semi dry, with a tomato based gravy and flavored with kasuri methi and garam masala. 1. 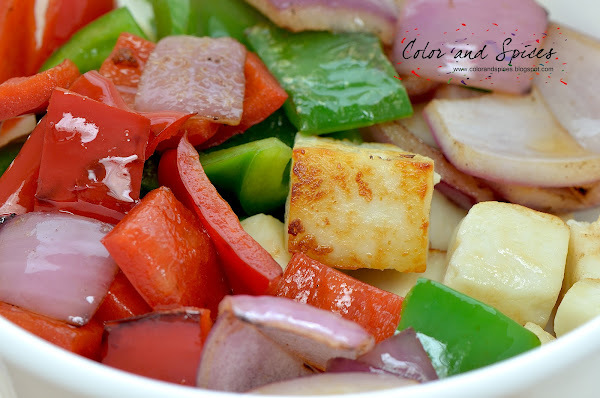 Cut paneer, bell peppers, onion into equal size squares. 2.In a flat non-stick pan heat oil, as the oil is hot put the paneer pieces in a layer and fry them in high heat for 3-4min or till the paneer takes a nice brown color. Keep turning the paneer pieces. 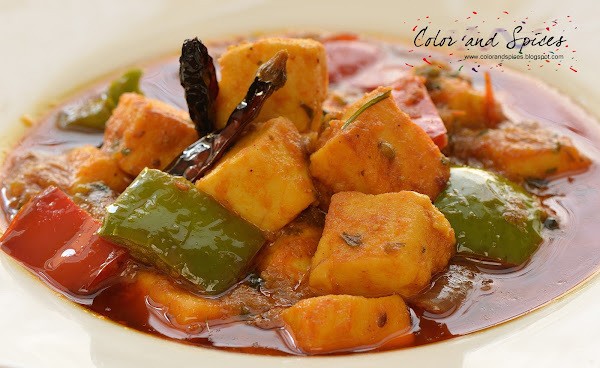 Do not overcook the paneer, or it will become hard. 3. In a kadhai or pan add oil(1tbsp), when the oil is hot fry the bell peppers on high heat for 2min. As the bell peppers take brown color on the edges take them out. It should be crunchy. 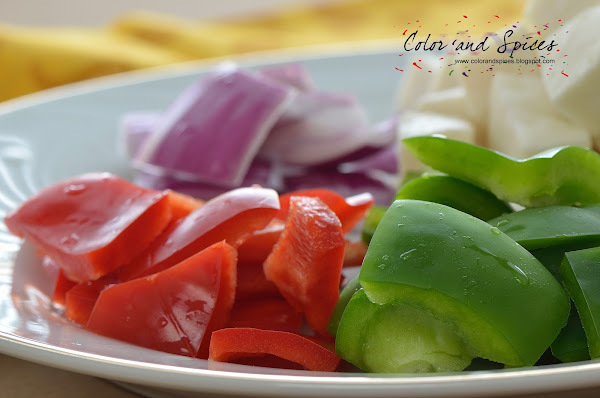 Add the bell peppers in small batches at a time to the oil. Keep the heat high, this will help the bell pepper to be crunchy. After frying all the bell peppers, fry the onions same way. Take out from oil and keep aside. 4. In the same pan heat more oil(2tbsp), add the sliced onions and cook on medium heat for 4-5min. Add the chopped garlic and cook for 2min. Add grated ginger and cook for 2min. Add chopped tomatoes. Sprinkle a little salt and mix well. Cover and cook till the tomatoes are mushy. Cook on high heat for 2-3min. Switch off heat and let this mixture cool down. As the masala cools down transfer it to a grinder or food processor and make a smooth paste. Keep it aside. 5. In a kadhai or pan add oil. When the oil is hot add half of the roughly ground coriander seeds and dry red chilies. I roasted the coriander seeds first then crushed them. Cook for 1-2min or till the spices release a nice aroma. Add the freshly made onion-tomato paste. Cook on low-medium heat for 3-4min and stir in between. Add turmeric powder, red chili powder, deghi mirch powder, coriander powder, mix well. Cook on medium heat till oil separates from the masala. Add 1/2 cup warm water and bring that to boil. Add salt and sugar. Mix well. Add the fried paneer, bell peppers and onions. Cover and cook on medium heat for 3-4min. 6. Check seasoning and adjust accordingly. Add kasuri methi, garam masala powder and rest of the crushed coriander seeds. Cover and let it stand for 5min. Serve hot with naan or roti. Your picture is so perfect and shiny, your recipe pictures urges me to make your delicious recipes.